Let's celebrate the season of spring with paper crafting. These beautiful paper tulips from white coffee filters will add a touch of brightness to your home or can be given as a gift. 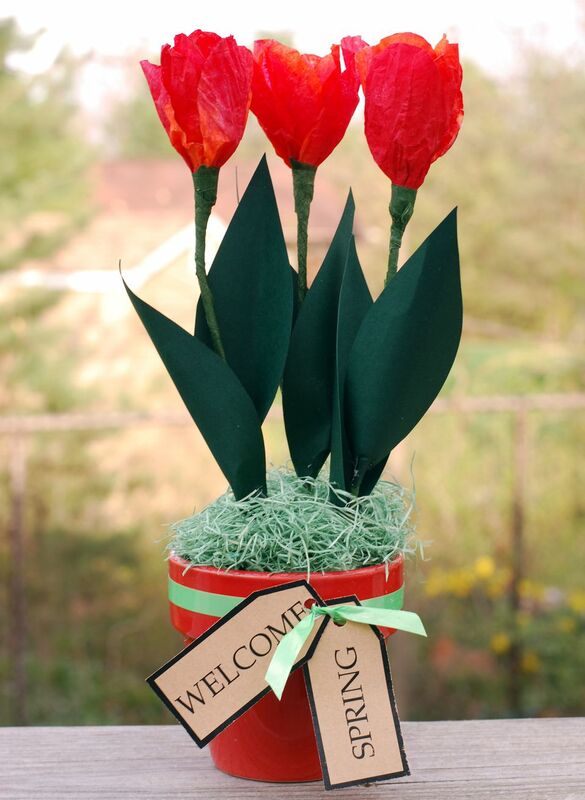 Either way, you will enjoy making this Paper Tulip Spring Arrangement. Cut a petal template from left over card stock. Trace the petal shape onto the coffee filter with a pen, as in the photo above. Cut seven coffee filter petals with scissors for each tulip made. Place the petals onto a surface that is protected from paint spillage. Paint each petal as desired with acrylic paints. Use a photo of a real tulip to help guide you in your color choices and design. I used red for the top and centers of each petal, and orange for the bottom and sides. After you paint the petals, spray the petals with fabric stiffener and let dry. If you wish you can help speed up the drying process with a hair dryer. Take each dried petal and twist into a sausage roll shape. This will give the petal texture and vertical design. Gently unroll each petal and shape into a flower petal. Wrap three pieces of floral wire with brown floral tape. Wrap a little extra brown floral tape onto the top of each piece of floral wire to form the "anther and filament" of the tulip. Wrap the three pieces of floral wire together with green floral tape.This will make the tulip stem wider and give it realism. Leave the top one and one half inches of brown floral wires unwrapped. Arrange three floral petals around the top of the wrapped floral wire. Secure to stem by wrapping with floral tape. Arrange four more petals around the flower and secure these to the stem with floral tape. *Optional You can spray the petals with fabric stiffener once again to give the petals some extra stability and shape. Let the flower dry completely. Cut the tulip leaves out of green card stock. Pinch the bottom of the first leaf and glue to the stem with hot glue. Pinch the bottom of the second leaf and glue it to the stem with hot glue onto the opposite side of the stem. Cut dry floral foam down so that it fits into the floral pot of choice. You may secure the foam to the pot with hot glue if you desire. Cover the floral foam with green Spanish moss. You can either carefully hot glue the moss to the foam, or secure it with floral pins. Place three tulips into the foam and arrange as desired. Tie some pretty ribbon around the top of the pot if desired. Add some tags with the sentiment of your choice if desired. Printable versions of the tags may be downloaded here.